The Gentlewoman: This gigantic tome is always a treat. It is laden with brilliant, clever stories and editorials throughout. It's a well designed, aesthetically pleasing magazine too which makes it all the more appealing. The Spring/Summer issue featured a cover story with Sofia Coppola, who I love. She was discussing her new film The Beguiled which I seriously need to see asap, among other things. If you want a read for a long plane trip, beachside or perhaps snuggled under some blankets in Wintry NZ, this is for you. Glamour Magazine (UK): Glamour magazine hasn't been on my radar for a while but after listening to this podcast episode featuring editor Jo Elvin, I was inspired to pick it back up again. The latest issue featured all their women of the year winners; including Sam and Nic from Pixiwoo, Amy Poehler, Nicole Kidman among others. It also included a column from Dawn O'Porter which I loved because I'm a Dawn fangirl, we all know that. There were some brilliant articles on stress and mindfulness included as well which were particularly timely for me. I'm not sure how often Glamour is released here but I will definitely be keeping an eye out for the next issue. 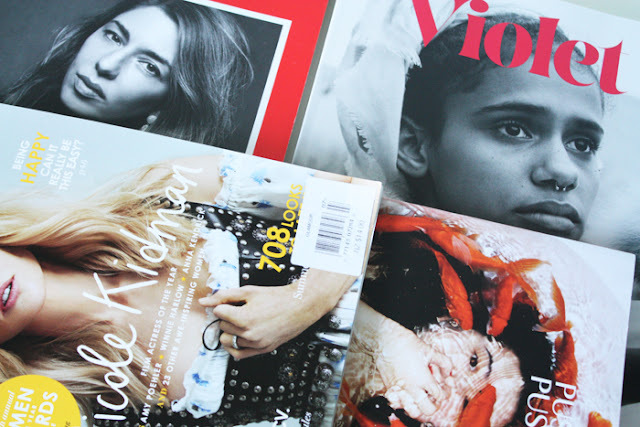 Violet: The newer brainchild of Leith Clark, the genius who used to edit Lula magazine. Violet, like The Gentlewoman is another hefty tome but it makes it all the more brilliant. There's more content to enjoy for one. Inspired by the recent women's marches, it's focused around getting women inspired and geared up for positive change in society. I haven't had a chance to really savour this properly yet but I will keep you posted on it because I'm sure it's going to be good. Puss Puss: Last year when I worked in a magazine shop, I remember seeing this and being wildly confused by the title. My gutter mind instantly assumed it was a vulgar reference but in fact, it is actually a magazine combining two of my loves. That being cats and fashion. I'm not sure if the latest issue is still around but it featured Grace Coddington, the queen of cat ladies and of course her cats, Bart and Pumpkin. It's a bit artsier than some of these other reads so if that kind of content is your jam, you might enjoy that side of things as well. It also features some brilliant interviews and imagery too. It's one you will want to hold on to and save for inspiration later on. -What magazines have you read and liked recently?